CBR1000RR Fireblade Equipped with Selectable Torque Control (with built-in Wheelie and Rear Lift Control), Selectable Engine Brake, new ABS brakes, an optional Quickshifter with Downshift Assist, Riding Mode Select System, Power Selector and fully adjustable Showa suspension. 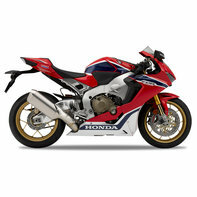 CBR1000RR Fireblade SP Equipped with semi-active Öhlins Step motor-type Electronic Control suspension, plus Honda Selectable Torque Control, Wheelie Control, Rear Lift Control, Selectable Engine Brake, new ABS, Quickshifter (with Downshift Assist), Riding Mode Select System and Power Selector. RC213V-S MotoGP derived technology elevates the riding experience even further.